Amethyst is the clear purple, mauve or violet form of the mineral quartz. As such it is related to citrine which is the yellow form of quartz, and also to rock crystal which is the colorless variety. It is possible for some specimens of quartz to be different colors in different areas. Amethyst and citrine are varieties of quartz which can both occur in the same stone. As our photograph clearly shows, the difference in color at the two ends create a striking contrast. Such stones are sometimes called ametrines, but we think they could equally well be called citrysts or citrethysts. Amethyst gets its name from a Greek word amethustos meaning "not drunken", as it was believed to protect against intoxication by alcohol. It would be interesting to test this ancient theory whilst being breath-tested, but don't cite us in your defense. We believe that amethyst is one of the most beautiful of the colored gemstones, particularly in its better qualities. As with other gemstones, the "best" color can vary according to personal preference, and the quality of amethysts can vary considerably. The most important attribute should be an attractive color. The rich deep violet color is generally the favorite and most expensive, but a stone of medium color intensity, with plenty of sparkle, can also be very attractive. Many of the amethysts for sale in High Street stores are only in low to medium quality, being either pale or quite included, and as a result are not particularly attractive. Aquamarine is the sky blue or sea blue variety of beryl, sometimes it is sea green, and less desirable. The word aquamarine literally means seawater, and is very frequently shortened to aqua. While all aquamarines are beryl, not all beryls are aquamarines. The color of aquamarine is due to the presence of traces of iron present as an impurity in the crystal structure of beryl. As with many gemstones, the color of aquamarine has almost always been improved by treatment of some kind. Heat treatment is used for aquamarines, to turn greenish, yellow or brown stones into a beautiful blue, and the color change is permanent. Even the best aquamarines are fairly pale compared with other gemstones such as sapphire. Large stones benefit from the effects of color saturation, and as aquamarine, unlike emerald, tends to form quite large clear crystals, this means that large aquamarines are relatively easy to find, and the price does not rise so steeply with size as it does with many other stones. It also means that small stones often lack color intensity and are therefore not as attractive. Small aquamarines with good color are therefore harder to obtain, and relatively expensive for their appearance. For small stones it may be preferable to use Ceylon sapphire instead. Citrine is the clear yellow or golden form of the mineral quartz. As such it is related to amethyst which is the purple form of quartz, and also to rock crystal which is the colorless variety. It is possible for some specimens of quartz to be different colors in different areas. Amethyst and citrine are varieties of quart which can both occur in the same stone. As our photograph clearly shows, the difference in color at the two ends create a striking contrast. Such stones are sometimes called ametrines, but we think they could equally well be called citrysts or citrethysts. The hardness of citrine is 7, and appears on the Moh scale as quartz. Citrine is often incorrectly and ignorantly sold as topaz. Although topaz and citrine can often be similar colors, they are both completely distinct gemstones. Often the owners and wearers of citrines ring call them topaz, presumably along the lines of wishful thinking. Many topaz are a richer color than citrine, containing more orange coloration. It may seem surprising that diamond is simply carbon, just like charcoal or graphite. In fact carbon has at least two other rare, and only recently discovered forms, or allotropes, known as fullerenes. The difference is caused by the different types of bonding between adjacent atoms to form different types of crystalline structure. In diamond, each carbon atom is bonded to four other carbon atoms in a tetrahedral structure, like a pyramid. Each link or bond is the same length, and the tetrahedral formation is therefore completely regular. It is the strength and regularity of this bonding which makes diamond very hard, non-volatile and resistant to chemical attack. Theoretically a perfect diamond crystal could be composed of one giant molecule of carbon. Carbon is a non-metallic element with the atomic number of 6, and an atomic Weight of 12. In combination with oxygen and hydrogen it is contained by all living objects. 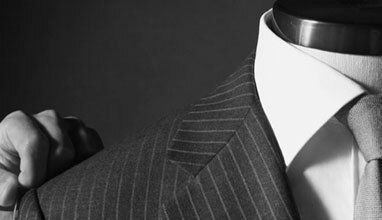 In the form of graphite it appears black or dark gray, opaque, and is very soft, whereas in the form of diamond is it clear, colorless, and extremely hard. Diamond possesses many qualities which make it an ideal gemstone. It is extremely hard, and also very tough and hard-wearing, and this also helps it to take a very high polish. 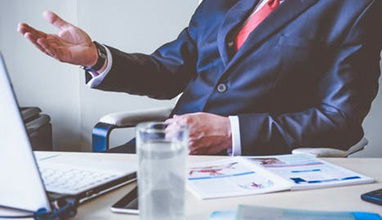 Some hard articles are brittle which detracts from their durability. There are some things which are harder than a diamond. In its pure form it is colorless, has a high refractive index, so has a very high luster. It possesses high dispersion, meaning that different light wavelengths are diffracted differently, giving a strong scintillating play of prismatic colors. Diamonds seem to have been known for about 3,000 years, being mentioned in Exodus chapter 28, however in early times, other hard minerals were often confused with diamond. It is thought that the earliest diamonds were found in about the 12th century B.C., in India , which remained the most important, if not the sole, source until 1725, when diamonds were discovered in Brazil. The Indian and Brazilian deposits had been almost exhausted when in 1866, the Eureka diamond was discovered in South Africa, followed by the Star of South Africa in 1869. Shortly afterwards, the great South African diamond rush had started, and South Africa remains one of the world's most important sources of diamonds today. 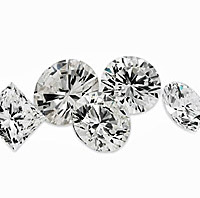 Diamonds have since been discovered in many other regions of the world, including Russia and Australia. Until the South Africa finds, diamonds were so rare and valuable, that they were only owned by the very wealthy. Through the publicity and promotion given to diamonds largely by the De Beers Company, and through the Diamond Promotion Service, diamonds have become the most desired gemstone. Thanks to large scale mining, and the development of efficient cutting methods and equipment, diamonds have now become a consumer luxury affordable to the masses. Mass production jeweler manufacturing techniques have also helped to bring diamond rings and other diamond jeweler into very affordable, even commodity, price ranges. 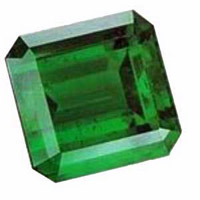 Emerald is the grass green variety of the gemstone called beryl. Although all emeralds are beryl, not all beryls are emerald. Pure beryl is colorless, often called white, and although quite rare, tends not to be valuable because it does not have much brilliance. Colors, as in many gemstones, are caused by small amounts of impurity, usually metallic oxides. This is a another case where impurity is desirable. Chromium, in the form of chromic oxide, causes the bright grassy green coloring in beryl, thereby producing emeralds. Vanadium can also affect the exact shade, as may traces of iron. It is also possible to have green beryl which is not emerald, because the coloring agent is not chromium. Emerald, along with other beryls, is quite hard, having a hardness of 71/2 to 8 on MohвЂs scale, compared with 10 for diamond, 9 for corundum, and 8 for topaz. Hardness is generally a desirable feature is gemstones. The earliest known source of emerald was near the Red Sea in Egypt, the so-called Cleopatra's emerald mines. They were probably worked from about 2000 B.C., apparently the location of them was lost in the middle ages, and not rediscovered until 1818. Most emeralds used in ancient jeweler are believed to have come from these mines. They are not worked nowadays because of the low quality of crystals found. Emeralds have been found in Austria since Roman times, in the Legbach ravine at Habachtal near Salzburg. These are no longer commercially mined. Columbia is generally recognized as the source of the world's finest quality emeralds, both in the past and the present. The Columbian Indians were using them before 1537, when Quesada conquered Columbia. Later the Spanish discovered that the emerald mines were at Somondoco, which means "god of the green stones", and which is now known as Chivor. The best colored Columbian emeralds are said to be those from the Muzo mine, although another mine at Cosquez is also highly rated. Russia has been another important source of emeralds in the past. Most Russian emeralds coming from Sverdlovsk or Ekaterinburg in the Ural Mountains. Emeralds were discovered in Australia in 1890 in New South Wales. Emeralds were discovered between1927 and 1929 at Gravelotte in South Africa, followed by other sources. Another important source of superb quality emeralds, usually only of small size, is Sandawana in Zimbabwe formerly Southern Rhodesia. These were discovered only in 1956. Emeralds were known in India from antiquity, but their source is not certain. The earliest known Indian source was 1929 at Arawalli in Rajahstan, other sources being discovered since. The quality of Indian emeralds is very variable, but most are of lower quality which are often polished as beads. Other sources of emerald include Norway, North Carolina, Connecticut, Maine, New Hampshire, although non of these are very important. Garnet is a naturally occurring gemstone. Its name comes from Latin granatus meaning seed, because it often resembles small round seeds when found in its matrix rock. Rather than a single gemstone, garnet is a family of related minerals, some of which occur as gemstones. Each has a common crystal structure, and a similar chemical composition. The popular understanding of garnet is as an inexpensive dark red stone. Because it is relatively common and inexpensive, it is often thought of as "only garnet", and as being inferior. This bias extends to other rare and attractive forms of garnet. Garnet occurs naturally in a large range of colors including: red, orange, brown, green, yellow, and brown. Its variability of color reflects the variations in its composition. 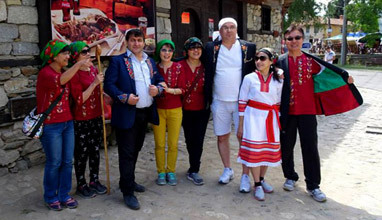 There are two main theoretical groups or "families" of garnet:- pyrope, almandite, spessartite, which are all (metal) aluminum silicates, and uvarovite, grossularite, andradite, which are all calcium (metal) silicates. In practice, there are probably very few garnets with the precise pure chemical composition shown for their type, almost all garnets are of mixed types, where one type is partially replaced by another type. 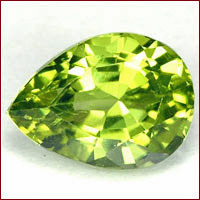 Demantoid garnet is a rare and beautiful bright grass green sub-variety of andradite garnet. It appears to have first been discovered around 1892 in the Bobrovka area of Russia. The Bobrovka is a small tributary of the River Tschussowaja in the Sissersk region on the western side of the Ural Mountains. It was at first thought to be emerald, which is found nearby, and has been erroneously called "Uralian emerald". The name demantoid means diamond-like, because it has a very high adamantine luster, and a color dispersion higher than diamond. The only disadvantageous property of demantoid is its low hardness figure at about 6.5 Moh. It is the softest of the garnets, and is more suitable for use in brooches, pendants, or ear-rings, rather than rings, because of this. The brilliant color of demantoid garnet is due to partial replacement of the silicate by chromic oxide. A diagnostic characteristic of demantoid is the inclusion of radiating fibers of byssolite (asbestos) fibers in a pattern described as a horse-tail. There is no other green stone which shows this feature. In late Victorian times, and early in the twentieth century, demantoid became a very sought after stone. It commanded high prices because it has never been available in large quantity. In recent decades, it has been unobtainable as newly mined stones, and has only been available from antique jeweler. Recently, small finds have again been made in Russia, and a small quantity of fine quality stones have recently come onto the market. Gemstone lovers wishing to acquire a piece of demantoid garnet should take this opportunity to do so. If the current seams of demantoid run out, there may be another century without new stocks of demantoid becoming available. Tsavolite, previously called tsavorite, is a bright green variety of grossular garnet, its color being induced by the presence of chromium. Opal is a paradoxical gemstone, and one of the most fascinating. It is a form of quartz, but is not a form of quartz. Quartz is very common, yet has many rare and precious gem varieties. Opal itself has numerous varieties. It is the most colorful gemstone, but some forms are colorless. It can be very bright and beautiful, and it can be dull and dead. It is best known for its flashes of color, but some varieties have no flashes of color, and are still opals. It can be black, and it can be white. 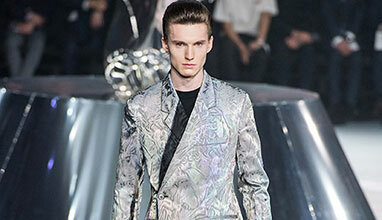 Its best known attribute, the brilliant flashes of many colors, are not called opalescence, but iridescence. Some people think opal is unlucky, but it is one of the most valuable and desirable of gems. Opal is a variety of quartz. Quartz in turn is silicone dioxide, one of the commonest minerals on earth. Quartz exists in a number of different forms, ordinary sand is one form, but there are numerous gemstone forms of quartz. Actually because opal is a gel, it is, strictly speaking, not a form of quartz. Quartz is a crystalline form of silicon dioxide, opal is a solid gel. However because the chemical formula is the same except that opal is hydrous, that is it contains some water which is chemically attached to the silicon dioxide molecules. Pearls are organic gemstones. Most gemstones are formed from inorganic substances, but a number of gemstones are from organic sources, that is from living things, either plants or animals. Natural or real pearls come mainly from oysters, although there are other bi-valve mollusks from which can produce them. Cultured pearls are produced by artificially introducing a foreign object into the fleshy part of oysters, which become coated with nacre in a similar manner to natural pearls. 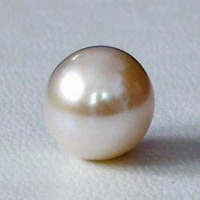 Imitation pearls are also made in various ways. Pearls are formed naturally by the oyster when a foreign object enters the shell and causes irritation to its soft tissue. The oyster forms a secretion around the object as a form of protection. The foreign object can be a number of different things including a grain of sand or a parasite. In time the coating builds up in iridescent layers. Pearls can be almost any shape, but round ones are generally more desirable. The hardness of pearl is 3.5 to 4.0. Imitation pearls, usually called simulated pearls have been produced for many years. They can be made with a plastic core or of mother of pearl, coated with a layer containing fish scales which give the iridescent effect. Teridot is a bright yellow green or golden green variety of olivine. It was originally found on Egypt's St. John's Island once known as Topazios, in the Red Sea, which is now known as Zeberget. It is also found in Burma, Sri Lanka, USA and Norway. Because there hardness is lower than 7, they are not ideal for use in rings, and should be treated with reasonable care. Bright golden green, but can vary to darker green or greenish yellow. Peridot has also been known as Chrysolite, although this is an old name which was applied fairly indiscriminately to any yellow and greenish yellow stones. It was also once incorrectly called topaz. There are also brown peridots. Since1952 many stones believed to be brown peridots have been found to be a different mineral called Sinhalite. Ruby is the usual name for transparent red corundum. Ruby is red or pink. Blue or any other color of corundum is usually called sapphire. Corundum is the mineralogical name for aluminum oxide. Corundum can be colorless, red, pink, red, black, brown, orange, yellow, green, indigo, violet, or mauve. Red corundum and most pink corundum is called ruby, all other colors are called sapphire, usually with the color specified as a prefix to the word ruby, for example, yellow sapphire. Pure corundum is colorless, often called white, and although quite rare, tends not to be valuable because it does not have much brilliance. Colors, as in many gemstones, are caused by small amounts of impurity, usually metallic oxides. This is a case where impurity is desirable. Corundum is very hard, having a hardness of 9 on MohвЂs scale, compared with 10 for diamond, and 8 for topaz. Hardness is generally a desirable feature is gemstones. Other uses for corundum, because of its hardness, are as watch bearings, watch glasses, and as an abrasive. Originally, the best sapphires and rubies came from Burma, where they are believed to have been mined possibly from prehistoric times. Certainly they appear to have been worked during the times of Marco Polo. Thailand, previously called Siam, is an important source of attractive ruby. Thai rubies are usually pink rather than red, and often slightly pale and silky. Many people seem to believe that the darker the ruby the better. just as many seem to believe the opposite. Neither of these opinions is correct. If you think, even briefly, about this it becomes obvious why. 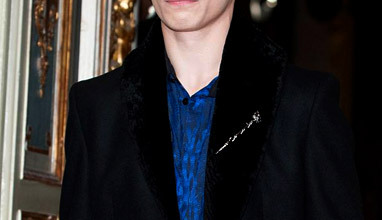 A very dark ruby would appear black, and would not be very attractive or desirable. The darkness often being caused by inclusions. An extremely pale ruby would be colorless, and not particularly attractive or valuable. As usual, the truth lies between the two extremes. The most desirable rubies are generally those with an intense red color, and plenty of sparkle and life. These latter two factors are usually helped by high optical clarity and skilful cutting. Ultimately which is "best" is a subjective matter, and personal preference is important. Our usual advice to potential customers is to buy whichever color of ruby they personally find the most attractive. We also think it's slightly sad that we need to give this advice. 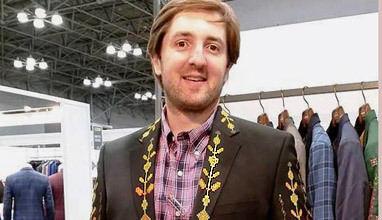 Buy what you like, using your own judgment, rather than allowing yourself to be a slave to fashion and buying what you think will impress other people. The main choice in the color of rubies depends largely whether you prefer red or pink. One important factor when selecting a ruby is to ensure that it will not clash with your nail varnish or other clothing and accessories. This is a more important factor with ruby than with almost any other gemstone. Colorless diamonds, blue sapphires, and green emeralds hardly ever clash with other colors, whereas reds and pinks require considerable more care when mixing with similar colors. Sapphire is the usual name for transparent corundum. The usual color associated with sapphire is blue, but sapphire can be almost any color. Corundum is the mineralogical name for aluminum oxide. Corundum can be colorless, red, pink, blue, black, brown, orange, yellow, green, indigo, violet, or mauve. Red corundum and most pink corundum is called ruby, blue corundum is called sapphire, and other colors are also called sapphire, usually with the color specified as a prefix to the word sapphire, for example, yellow sapphire. Brilliant orange sapphires are sometimes called padparascha. Pure corundum is colorless, often called white, and although quite rare, tends not to be valuable because it does not have much brilliance. Colors, as in many gemstones, are caused by small amounts of impurity, usually metallic oxides. This is a case where impurity is desirable. 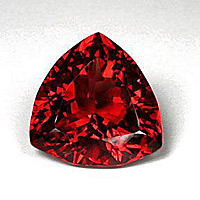 Chromic oxide causes brilliant red coloring in corundum, thereby producing rubies. Ferric oxide causes yellow coloration, titanium oxide produces vivid blue. In fact the coloration of sapphire is not quite so simple as this. The titanium and iron are usually present in the form of ilmenite, a mineral which is a titanium iron oxide, TiFeO3. Ilmenite is not isomorphous with aluminum oxide. Isomorphous means being able to replace the host mineral within its crystal structure. Instead ilmenite is present as a microscopic inclusion, in the form of colloidal particles. This colloidal nature may be responsible for other optical effects such as "silk", asterism, and color banding. Corundum is very hard, having a hardness of 9 on Moh's scale, compared with 10 for diamond, and 8 for topaz. Hardness is generally a desirable feature is gemstones. Other uses for corundum, because of its hardness, are as watch bearings, watch glasses, and as an abrasive. Originally, the best sapphires and rubies came from Burma, where they are believed to have been mined possibly from prehistoric times. Certainly they appear to have been worked during the times of Marco Polo. Kashmir is another source of very fine sapphires, famous for its cornflower blue stones. Thailand, previously called Siam, is an important source of attractive sapphire. 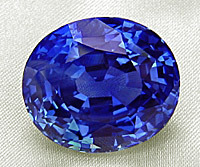 The term Ceylon sapphire is frequently used to denote pale to medium sapphires. Unless the stone is known to originate from Sri Lanka, as it is now called, such sapphire should accurately be called "Ceylon-type" sapphire. 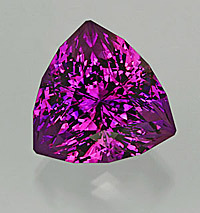 Currently most dark sapphires come from Australia, and the term "Australian sapphire" is often used to denote dark colored sapphires, in a similar way to the term "Ceylon sapphire" for lighter stones. Sapphires are also found in Montana and Colorado in the USA, India, with small quantities being found in numerous other countries. We are frequently informed, by partially educated customers that the darker the sapphire the better. We are equally frequently and erroneously told the opposite. If you think, even briefly, about this it becomes obvious why. A very dark sapphire would appear black, and would not be very attractive or desirable. The darkness often being caused by inclusions. An extremely pale sapphire would be colorless, and although rarer than black sapphire, is not particularly attractive or valuable. As usual, the truth lies between the two extremes. The most desirable sapphires are generally those with an intense blue color, and plenty of sparkle and life. These latter two factors are usually helped by high optical clarity and skilful cutting. Ultimately which is "best" is a subjective matter, and personal preference is important. 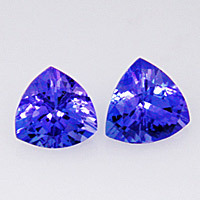 Our usual advice to potential customers is to buy whichever color of sapphire they personally find the most attractive. We also think it's slightly sad that we need to give this advice. Buy what you like, using your own judgment, rather than allowing yourself to be a slave to fashion and buying what you think will impress other people. Tanzanite is the name given to transparent blue zoisite. It was discovered in Tanzania in 1967, and was introduced into jeweler in 1969 by Tiffany & Co. of New York. Usually blue, lilac blue, or deep violet blue, but other colors are possible including green, yellow, pink, brown and khaki. These colors and also paler blue stones are often heat treated to produce the preferred deep blue color. Tanzanite is slightly fragile, and can fracture badly, ultrasonic cleaning should be avoided, but otherwise it is very suitable for jeweler, being a very beautiful stone, similar to sapphire. Famous examples: A specimen named "The Midnight Blue", of 122.7 carats is located at the Natural History Museum in Washington, DC., USA. 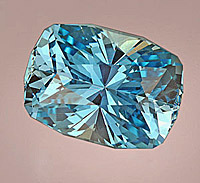 Topaz of the best known gemstones. Even its name sounds like something exotic and fabulous from The Arabian Nights, or poetic like "silken Samarkand". In fact its name is so popular that most of the owners of a citrine claim to own a topaz! The name is believed to have derived from the Greek work topazos, the ancient name for St. John's Island in the Red Sea, or from the Sanskrit tapas meaning fire. Topaz is well known to be yellow, and in ancient times all yellow stones were called topaz. Nowadays we know better. Topaz can also be colorless, blue, green, pink, orange or brown. The classical precious topaz is yellow or yellow to orange-brown in color. Sherry or Madeira (I suppose it goes well with the tapas!) would best describe the most desirable color. In the last 10 years or so, jewelers' windows have become filled with blue topaz, which is very attractive and inexpensive, and has to some extent become a substitute for Ceylon sapphire. Blue topaz does occur naturally, but almost all commercially available blue topaz is produced from less attractive colors which are irradiated and heat treated to turn them blue. 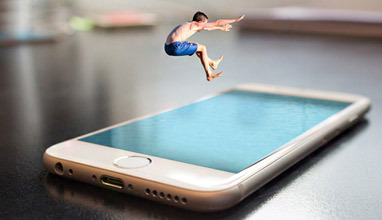 This treatment produces a stable color, and normally the stones are not radioactive when they are released on the market, although there have been cases where stones with an unsafe level of radiation have been sold. There are distinct hues of blue topaz, which we presume arise because of the different treatments. The most usual colors are known as "London Blue", "Swiss Blue" and "Sky Blue", we have listed these in order from the deepest to the palest colors. Tourmaline is generally thought of as green, but can be almost any color, indeed some tourmalines display two or more colors within the same crystal. Because of the naturally occurring shape, tourmalines are often cut as long baguettes, emerald cuts, or ovals. Large size tourmalines are more relatively common compared with other gemstones, so they are ideal for large jeweler pieces. 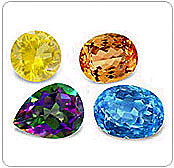 As with all gemstones, the most attractive colors and qualities are more expensive than lower qualities, and large desirable pieces are not cheap. 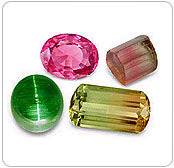 Tourmaline exists in more colors than any other gemstone. 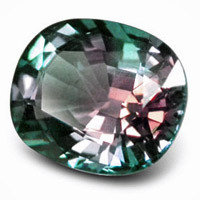 The most common color is a dark green, but bright green chrome tourmalines are seen, as are blue, red, pink, orange, yellow, colorless, brown, violet and black. Strongly colored pink tourmaline is sometimes called rubellite. Chatoyancy or chatoyance, literally from French means cat's eye. Seen best in cat's eye chrysoberyl, but also found in a few other gemstones including tourmaline.